You're welcome. Thank you for continuing the study of stray light. I have these same archs in both my Celestrons. Thing is, ones the C90 and the other the C6. They have completely different curves on the correctors, one being MCT and the other SCT. Because the curves are so different but the archs are the same, do you still think this would be from the corrector? Both of the Meade SCTs do not have this issue at all. A similar reflection but a very different form of corrector would indeed suggest another cause. It would be interesting to study how the reflection changes as the light source is systematically moved across the field (and even outside, if warranted); this would supply clues to the cause. If your subject is in the center of the field, once you start panning away from the center, I start to see this at around 60% of the FOV. When it is first seen it is pretty round. As you continue toward the edge, it elongates and is shaped more like a football. When you get to about 90% of the FOV, it goes away. This happens at or around the same percent in both the C90 and the C6. Does this give you any ideas? If this info does not help, I can setup and shoot video of a star panning across the field. A video isn't required; three or four still images covering the range should do it. I will take the images as soon as I get home from work and post them. No surprise but I contacted Celestron and they said they have no idea, never heard of it before. Doing the images I found something strange. In my 32mm 67 degree eyepiece, it shows as I had posted before. When I started doing the images, I did not see this. I moved the star to the bottom left corner and it just starts to show. The problem must start at APS-C sensor size and shows more as you get farther out. I don't have a larger sensor to take more images. I hope this gives you some kind of idea. I took the visual back off and looked right into the primary baffle as far off center as you can get you eye. You can not see any of the correct at all, just the inside of the secondary baffle and this is right at the back cell where a visual back would be connected. Attached in the link below is a ZIP file with the pictures I took. If I make the images small enough to post you can't see the stars but I have some new information. When you see this arch, if you defocus the star the bright arch does not change. Even if you defocus the star to the point you almost can not see the star, the arch is still bright and in focus and the same size. When you first see the arch it is small and points toward the center of the field. As you pan away from the center the arch gets bigger. Changing the focus at any position of the star when the arch is showing, never changes the arch size or the focus of the arch. Does this help any? Interesting how this reflection remains the same in spite of significant defocus! 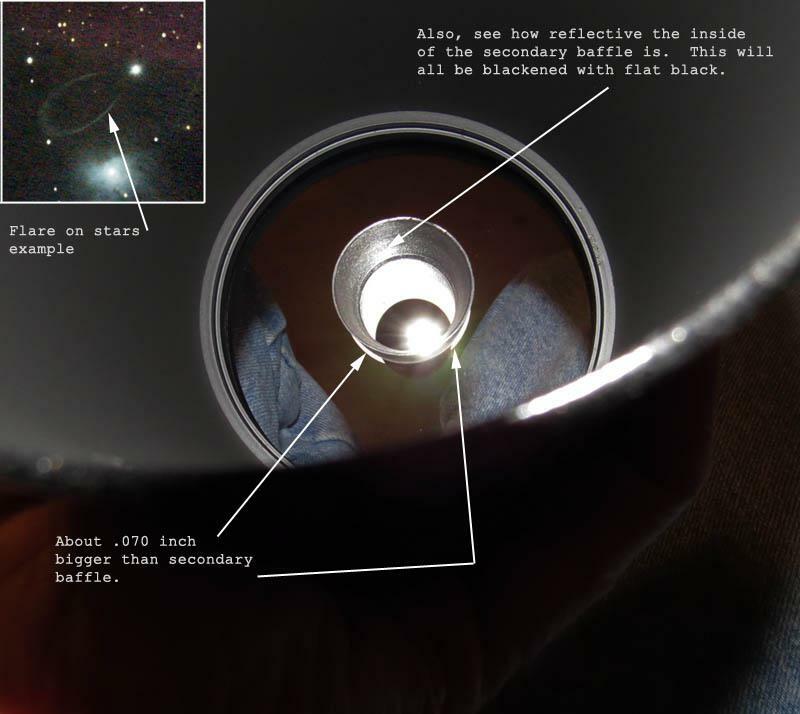 And what bothers me is that it's visible when the light source (star) is well inside the field of view. Is this ever seen visually, or only when a camera is present? If the latter, it would seem the camera is the culprit. My provisional 'analysis' , based on the camera theory, is that the CCD array is causing a conical dispersion, which is reflected back by the camera's window. But then, how to explain the fact of the unchanging aspect of the reflection with defocus? Does the camera's chip have microlenses? I'm still floundering about in something of a vacuum. If there are details which can further restrict the range of conditions when this reflection is present, it would help. Camera at prime focus or through eyepiece? Any other optics/filters present in the train? It does this with the camera or the eyepieces. It does this with a 40, 32, 24.5mm swa. Using an 11mm or shorter FL eyepiece it does not show. With the 24.5mm 67 degree, you have to move the star completely out past the field stop before you see it. With the 32mm 67 degree it shows from about 60 percent of the field all the way to the edge but it is getting very dim at the field stop of the 32mm. I have used this same diag and eyepiece on the 8 inch sct and see no hint of this issue. I also see it on the C6 with a 1.25 inch diag. This has to be some reflection off the primary baffle to the secondary for it to stay in focus. I have looked into the tube with a bright light but do not see anything that should cause this. I think I will just pull the unit apart and see what I can find. I found the problem on both the C90 and the C6. The C90 secondary reflective spot is about .020 inch bigger in diameter than the secondary baffle. This leaves a .010 inch reflective ring around the out side of the secondary baffle. This also explains why if the object is dead center you don't see the issue. On the C6, the issue is very much the same. The machined secondary holder that is on the outside of the corrector plate, is again about .020 over sized compared to the secondary baffle. It is black but very smooth and very reflective. The artifact was worse in the C90 and this explains why. Just wanted to post the findings because someone else may want to know or correct their own. I gather, then, that a portion of the 'oversized' reflective surface outside the secondary baffle is seen when you peer up into the rear port with your eye roughly at the focal surface but some distance off axis. It seems a reasonsble source of this very geometric reflection. And it's in line with my much earlier supposition that it resulted from a reflection off the corrector. If the onset of this reflection occurs at a *fixed* angle off axis, it would support your thesis, whereby the light source must lie at a certain off-axis angle so that its reflected light can get past the blockage of the secondary baffle. A test could be devised involving a beam splitter, an illuminated pinhole and a camera or eyepiece. The beam splitter is mounted immediately in front of the camera/eyepiece, the latter 'looking' into the scope as normal. The illuminated pinhole shines into the beam splitter, it's location being at or near the focal surface, and adjustable in lateral position with respect to the optical axis. The front of the scope is covered, so as to provide a dark field. If the same oval reflection is seen, mystery solved. On my previous post, just above, I stated the issue I found on the Celestron C90 and also the C6 with any bright object off axis creating a flare. 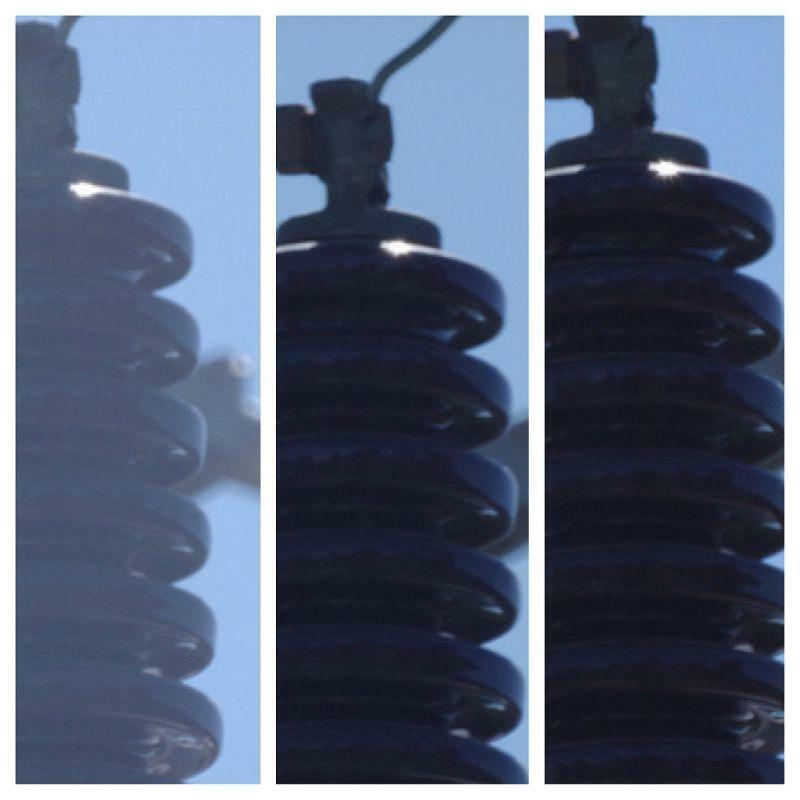 Below is an image I have taken to show the issues I found and also a sample crop from a pic showing this flare. I will not try to blacken the extra large portion of the secondary spot on the corrector. To fix this, I am placing a 1 inch o-ring over the baffle and pushing it forward until it touches the corrector plate. I found one at ACE that is just the right thickness. This will block the light from this part of the secondary and it is a tight fit so it will stay in place. See the attached photo. I anxiously await the result! 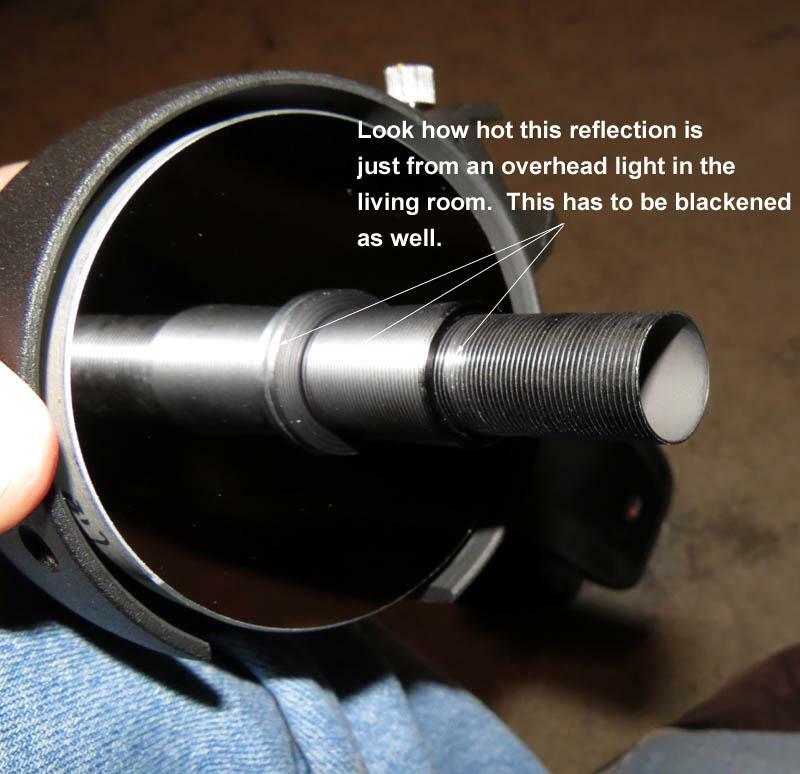 I find it astonishing that scopes would be finished with such potentially damaging portions of highly reflective surfaces being exposed like this. I've seen the effectiveness - particularly well - with Ed Hollands photos and the primary and secondary baffle have been discussed as well as an extending hood . I've got to ask - is there any merit in flocking the inside of the OTA that houses everything? I mean the less light scatter the better right? Or is this too minimal compared what else is at work? All surfaces which could conceivably scatter light down to the focal surface--including via double or multiple reflections--should be baffled or deadened against reflection. For example, even though the inside wall of the main tube is/may not be directly visible from the focal surface, a bright off axis light source could illuminate it, which in turn illuminates the front portion of the primary baffle. That latter surface *is* 'seen' from the focal surface. Thanks Glenn. There's been conjecture in the past over the value of it. Though in those arguments it was not as applied as this thread has been in working the problem from aperture to focal plane. Thanks. Here is another image showing very hot and reflective parts of the baffling. The inside of the OTA is very good with a very matt finished and no noticeable spots of high reflection. This mirror assembly will have to come apart to clean up and fix the primary baffles. 6) flocking the ring at the base of the primary baffle that pressed against the primary to hold it down. 10) blackening the bottom of the eyepieces, as seen from the front of the scope. Note that a well placed series of baffles could eliminate the need to blacken the bottom of the eyepiece or the inside of the primary baffle. Meade did a much better job of that kind of baffling in their 14" LX200, for example. One could also flat blacken the edge of the secondary and primary mirrors and the corrector, but I did not do so. If the scope being worked on is a Gregory-Maksutov Cassegrain, there is no "edge" to the secondary mirror. I should also have flat-blacked the background behind the secondary and primary mirrors, but did not do that either. Prior to the above changes, the scope had a gray background to the images. Afterwards, the background was velvety black. Thanks, I plan on all the above. I'll try to document all this as I go along and post it when done. I look forward to your results. I've read some folks concerns regarding out gassing of paints and flocking glue potentially affecting the coatings. Is this an unfounded concern? No, it is real. You have to bake these parts or leave it apart for a week or two to cure before it goes back together. Most times I bake my parts before they are sprayed, so they gas out as soon as the paint goes on. Due to shape, etc. you can't always do this. Here's a side by side of Ed Hollands flocking improvement pics. The last frame is subtle but the differences are real enough.